The outer cover is made from innovative three dimensional fabric. The cover consists of two pieces of soft mesh fabric, joined 10mm apart with strands of polyester fibre creating a ‘wall of air’ that won’t crush when depressed. The cover is filled with two fibre pads, each are encased in an open weave mesh fabric. Between these two pads is a memory foam insert which provides a ‘crown’ effect offering greater comfort. The cover is fully removable, and is machine washable. 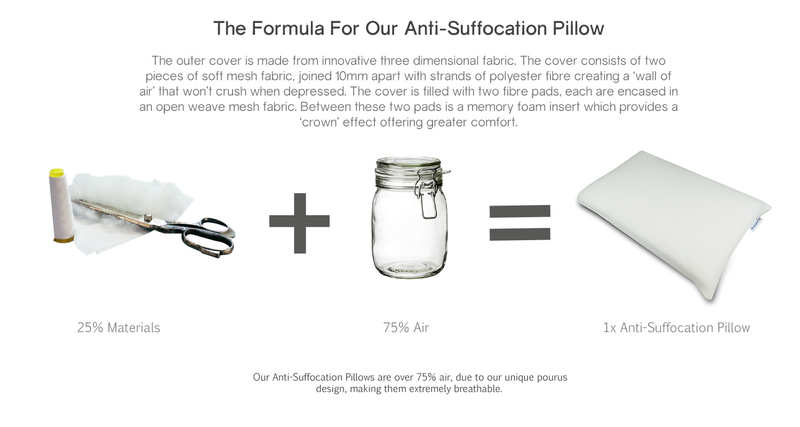 The pillow is fully adjustable to suit your needs. Each of the inner fillings / foam pads can be removed so that you can find the correct height & comfort to suit your sleeping style. Please see the images below for examples of how you can adjust your pillow. The Breathe-zy comes in this format, it provides a the highest level of support. It consists of the two fibre pads, along with the waterproof memory foam pad in the middle. The air flow test was conducted on the pillow in this format. By removing one of the fibre pads, it reduces the thickness of the pillow. The waterproof memory foam pad remains in the pillow, which provides the crown effect offering greater comfort. The two fibre pads remain in the pillow with just the Waterproof Memory Foam pad is removed. Although the pad provides a crown effect which some find to be important, the two fibre pads offer a high level of comfort. This particular variation of the pillow is received well by those that like to sleep with a standard single pillow. Youths & Children tend to find this variation of the pillow the most suitable. With all the inner components removed other than a single fibre pad, this offers the bear minimum support for the Breathe-zy Pillow. This variation is suitable for young children / infants. Air flow with the single fibre pad is still much greater than standards pillows.